For media inquiries please email or call Christian Cowley at 604-463-2229. Helping homeless youth is Teesha Sharma’s passion, one that earned her the inaugural Citizen of the Year Under 40 award at the Maple Ridge Community Foundation gala over the weekend. “Shocking,” was the only word Sharma could find to describe the award. Sharma has had to overcome major obstacles in her own life to get to where she is now, as youth services program director at the CEED Centre Society. She grew up in an abusive home and was cycled in and out of youth shelters before ending up homeless. When she was 16-years old, the Ministry of Children and Family Development put her in an apartment by herself. She was diagnosed with post traumatic stress disorder and went into social isolation for quite some time. “I can’t say how many times I attempted suicide. A lot,” said Sharma. Then at 22 years old, she was about to make another attempt to take her own life when she realized that if she did kill herself, all of the abuse she endured would not only have taken away the years that she lived, but those that were to come. Sharma went back to school and decided to find a way to change the way that society works with youth. She graduated class valedictorian. Her first mission was to start long-term youth housing. ”I went to every organization in Maple Ridge, knocked on the door and told them my story and what I wanted to do,” explained Sharma. “Everybody just said, ‘That’s nice, but we can’t help you,” she said. That’s when she knocked on Christian Cowley’s door at the CEED Centre. As the centre’s executive director, he wanted to help Sharma realize her dream. His help has enabled her to create barrier-free programs for youth ages 13 to 24 years old. The programs are accessible for youth and don’t have intrusive intake requirements. “One of the biggest problems, not just in Maple Ridge, but in B.C., programs from agencies tend to have a lot of barriers and eligibility criteria that really disqualifies so many youth from the get-go. And then they hear no after no and they stop asking for help,” explained Sharma who, believes in meeting youth where they are at instead of forcing them to conform to the norms in the community. “An eight-hour shift for a homeless youth is not going to work, but a three-hour shift is manageable and accessible to them,” she added. Sharma started Blue Door Youth Services, which includes a program called Go Figure, a youth-led support group for youth 13-24 with anxiety and depression. The group meets twice a month and is a mix between round-table discussions with individual check-ins. A mentor training component teaches community members how to understand, identify and support youth struggling with mental health issues and provides insight into how to best communicate and empower disenfranchised youth. “Then, of course, our outreach services to our unsupported homeless youth, of which there are a lot in Maple Ridge,” said Sharma. She is also on the steering committee, as a youth with lived experience, at the Youth Wellness Centre. Sharma’s biggest endeavor this year is a new employment program for homeless youth that she will be launching soon. “We are going to employ homeless youth to pick up and collect organic waste from local offices,” she said, adding that local MLAs Bob D’Eith and Lisa Beare will be the first offices to take part. “The shifts will be really short so that they don’t overwhelm the youth who are homeless,” said Sharma, noting that the job is really an engagement tool. “The point is to build those relationships,” she said. Twice a month, the youth employment program provides group training and youth who participate get their RentSmart, WorkSafeBC and Food Safe certificates. What Sharma would like to see in Maple Ridge right now is a youth safe house, as opposed to a shelter. Iron Horse Youth Safe House in Maple Ridge closed in January 2015 after federal funding was redirected as part of the federal Housing First Strategy. A youth shelter is only available for seven days, and a person has to be out of the house from 7 a.m. to 7 p.m. and the locations are available to the public. “We only actually have 20 low-barrier youth beds in B.C. The closest one to us is in Abbotsford and it is a faith-based one,” said Sharma. A youth safe house, Sharma explained, is at an undisclosed location, where youth don’t have to leave the house every day, which she believes is crucial for youth that are being exploited. “That’s one of the biggest things we are advocating for right now and I would very much like to see that happen,” said Sharma. Cowley, who nominated Sharma for the award because of her work ethic, says she is pretty incredible. “She endured a lot as a youth and she works and volunteers the way she would have liked to be treated herself in every case, even with the seniors, even with people who are technically not in the age range that we serve in our regular work,” said Cowley, adding that she gives unconditional support to people. “She spends almost none of her salary on herself and almost all of it on the people she works with and supports as volunteers,” he said, noting that Sharma feeds eight to 10 youth every night, for the most part, out of her own pocket, in addition to making the meals and delivering them. Sharma did her entire first year at the CEED Centre as a volunteer and has been paid part-time for the last two years, even though she works seven days a week. 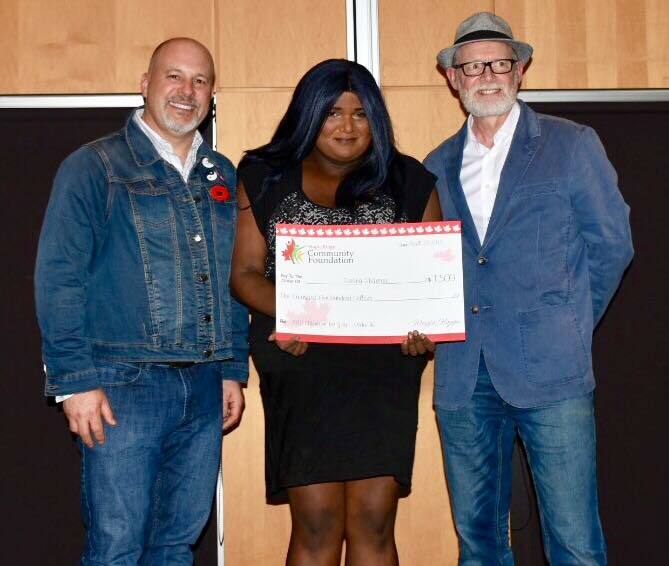 Teesha Sharma receiving a cheque for $1,500 for the charity of her choice as Citizen of the Year under 40. Roger Cummings and Bart Findlay flank her. Teesha was overwhelmed by the honour. Dr. Biju Mathew and Teesha Sharma announced winners. ​The Maple Ridge Community Foundation’s annual Citizen of the Year awards were announced Saturday, with Dr. Biju Mathew winning for Lifetime Achievement. Teesha Sharma earned the Under-40 award. Mathew was nominated for his volunteer work with the Ridge Meadows South Asian Cultural Society, Ridge Meadows Hospital Foundation, Youth Wellness Centre, Nurse Practitioner program and MRCF’s 25/40 Campaign. He donates all proceeds from his best-selling book, Super 30 – the Anand Kumar story, to the Super 30 teaching program in India. “Today, to me, all tonight’s nominees are winners, and so are all the people assembled here,” Mathew said. Julie Koehn and Kim Dumore were also up for Lifetime Achievement. Koehn was nominated for her volunteer efforts with the Ridge Meadows Recycling Society, Maple Ridge Historical Society, Community Heritage Commission, Alouette Correctional Centre Citizen Advisory Board, SPEC, Earth Day, Girl Guides of Canada, Family Education Centre, Webster’s Corners Community Association. She was a founding director of the Ridge Meadows Recycling Society, and served on the board of directors for 30 years. Dumore was nominated for her selfless volunteer work throughout the community, including Cythera Store, PLEA, Youth Unlimited, Humans of Maple Ridge event, Maple Ridge Opioid Overdose Response Task Group, Golden Ears Kiwanis Club, Maple Ridge Arts Council, Friends in Need Food Bank and Puttin’ on the Glitz. She is the current chair of the school system’s District Parent Advisory Committee. This was the first year there were three award categories: Lifetime Achievement, Under 40, and Youth. Sharma won for Under 40 for her volunteer outreach work in the community. Sharma commits herself to local homeless youth by preparing them daily meals, administering first-aid, and providing personal support. She is on the board of the Golden Ears Transition Initiative and is a founding member of the Youth Wellness Centre. “Thank you. “Chelsea and Cheryl, you guys are also amazing,” Sharma said. Chelsea Keenan was nominated in Under 40 for her dedication to teaching yoga classes with a charitable twist. After taking a self-exploration journey, which led her to exciting places around the world and obtaining her yoga teacher certification, Keenan’s generous spirit called to her to return home, and give back to her community by increasing engagement in wellness. She has developed a series of donation-based yoga classes dedicated to a variety of Maple Ridge charities. Cheryl Zandbergen was also nominated in Under 40 for creating and leading the Moms Gone Wild group in Maple Ridge. Established to create a comfortable space for mothers to join activities in a judgment-free, supportive environment, Moms Gone Wild hosts several events each week. Zandbergen leads this group to participate in many fundraisers, including the Maple Ridge-Pitt Meadows Christmas Hamper and fundraising for local families facing hard times, illness or crisis. The Youth award winner was announced last month, and Ryder Moore, an eight-year-old who has established the Ryder’s Rainboots charity to help give homeless people rain gear, is the winner. The other nominees were Marlowe Evans and Gurleen Goraya. The award is for people 18 and under. The foundation is now in its 27th year of issuing the awards, and for the first time the executive wanted to add more categories. The foundation’s goal is to recognize people who serve their community without regard to personal gain. Apr. 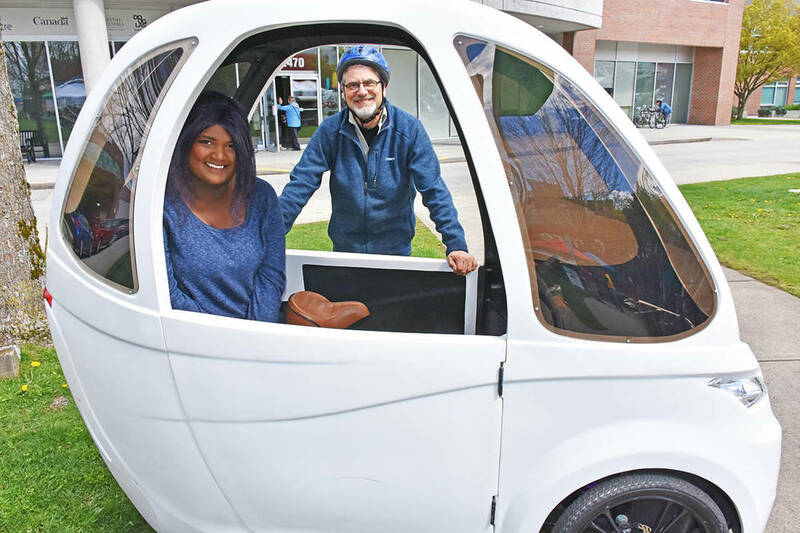 25, 2018 12:00 p.m.
A new vehicle will be silently gliding around downtown Maple Ridge, stopping to collect the organic waste at local businesses. Christian Cowley was showing off the new vehicle at Earth Day on Saturday in Memorial Peace Park. 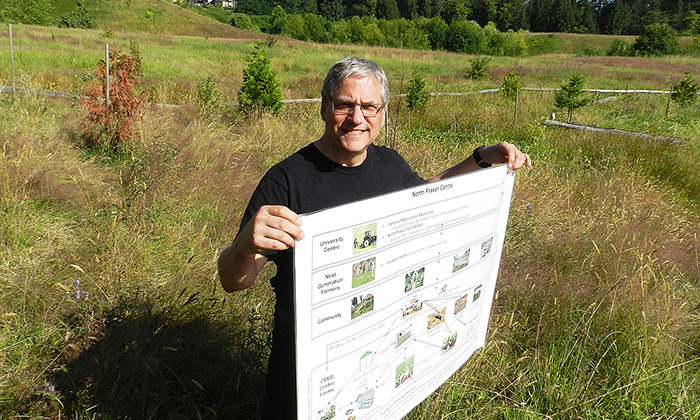 Cowley is the executive director of the Community Education on Environment and Development (CEED) Centre in Maple Ridge, and talked about a new program he calls Velorganix, and how it will benefit the young people hired to collect the organics. His employees will be youth who are homeless or coming out of the justice system. They will be trained as employees to take the bike around and collect organic waste, giving them pre-employment training and helping them integrate into the community. “The real core of the program is helping them move ahead in life, from a bad start,” said Cowley. The vehicle itself is called a Virtue Pedalist, and is a fibreglass body around a bicycle frame. It is a two-seater, with one seat behind the driver, and is still narrow enough to use bike lanes while storing cargo in the front. The young people involved in the program will get bike training from Jackie Chow of the HUB cycling group to make sure they can do the job safely. Cowley said because the goal is to give the kids a fresh start, they will have short shifts and will get paid for their work, and clients of the program will pay a nominal fee. Already the two MLAs offices in Maple Ridge are on board, and more downtown businesses will be solicited. Cowley expects to have the new Velorganix program up and running in June or July. Teesha Sharma, Youth Services Director at the CEED Centre Neighbourhood House, is mentioned as a community change maker in a Global News at Noon Weekend interview of Anuschka Naidoo, YMCA Manager of Mental Wellness Programs and co-founder of the YMCA Mindfulness Groups. Both Naidoo and Sharma are featured speakers at the first Y Talks event, which highlights community impact stories from some of Vancouver's change-makers. An idea for an agri-food and farming hub that sprouted a few years ago is taking root as the North Fraser Centre, which Christian Cowley would like to get growing as soon as possible. And he thinks the old Jackson Farm in Albion, on 102nd Avenue, would be an ideal place for a centre that would put a focus on farming. The centre could occupy about half of the farm’s 39 acres and offer hands-on and business courses in farming, in partnership with B.C. universities. A community garden, farmer’s market, and crops grown for restaurants and kitchens could be part of the operation, which would start small, then gradually build. Cowley is with the Community Education on Environment and Development Centre, which is leading the proposal. The centre doesn’t have to go in that location, but for Cowley, it makes sense, although it would require lots of explaining to show how it would fit in a location that’s intended to be a park. A community effort in resulted in the city saving Jackson Farm from development in 2011 with plans to turn it into a park. Stuart Pledge, with the Friends of Jackson Farm, hasn’t heard about the CEED Centre proposal. Parks staff have said that before any decisions are made about Jackson Farm, a public process will take place. “Our goal is to have the farm developed as a passive park. It’s a proposal that would cost very little,” and be accessible to everyone, Pledge added. Maple Ridge council heard the presentation from the CEED Centre last fall, when it asked for the city’s general support for the concept of a farm centre and for permission to use the True North Fraser branding program that was announced in 2013. But the key part of the request to the city is for it to provide about 20 acres for the centre, at no charge, for five years, after which the centre should turn a profit and lease payments could be made. So far, the city hasn’t responded. Other locations for the farm centre could be Albion flats, near 105th Avenue and Lougheed Highway, Cowley told council on Tuesday. The Agricultural Land Commission has said that land on the west side of 105th Avenue must remain in the reserve. However, the land has poor drainage and also would require measures to protect fish-rearing habitat in Spencer Creek, which flows through the Albion flats. 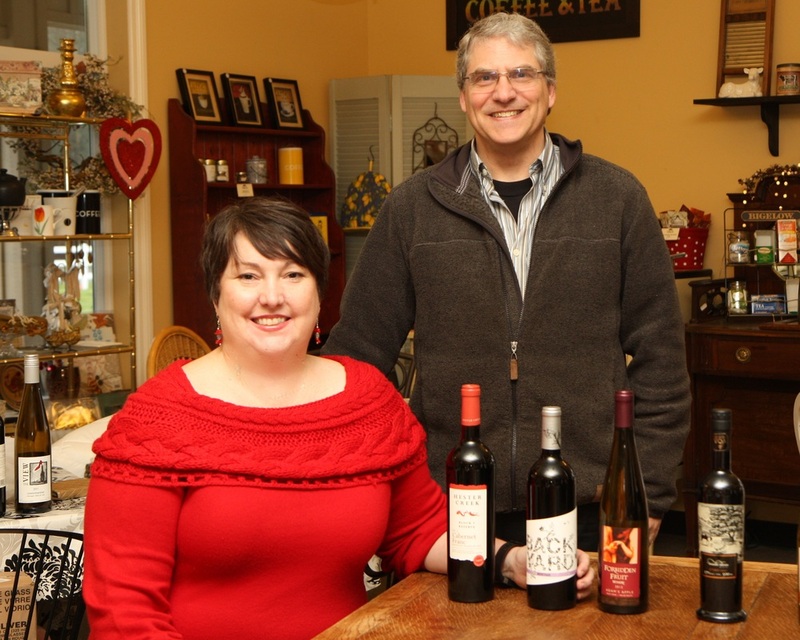 “It does provide some extra challenges that you wouldn’t find on Jackson Farm,” Cowley said. The idea of a farm centre isn’t a new one and was first considered as part of the B.C. Jobs Plan discussions from four years ago. A key part of the farm centre is creating an agri-food hub, where small-scale farmers could bring their crops and pool them with other farmers for better and cheaper distribution. “The upside for Maple Ridge as a city is to actually put into agricultural production, its small-lot farms,” Cowley. With universities becoming involved, it could begin the process of bringing post-secondary education to Maple Ridge, which has been the goal of the North Fraser Education Task force. Cowley said features for the public such as community gardens, a farmer’s market, interpretive programs, public harvesting or courses on grafting, gardening, would fit well within Jackson Farm. Cowley said the idea goes back to previous councils adding that farm centres are common in the U.S.
Theo Lamb, a professional facilitator and community leader, speaks to a small crowd gathered at the Clarke Theatre on Wednesday afternoon. Lamb was emceeing the Coming Together event, a day-long symposium on the issues of homelessness, mental health and addiction. 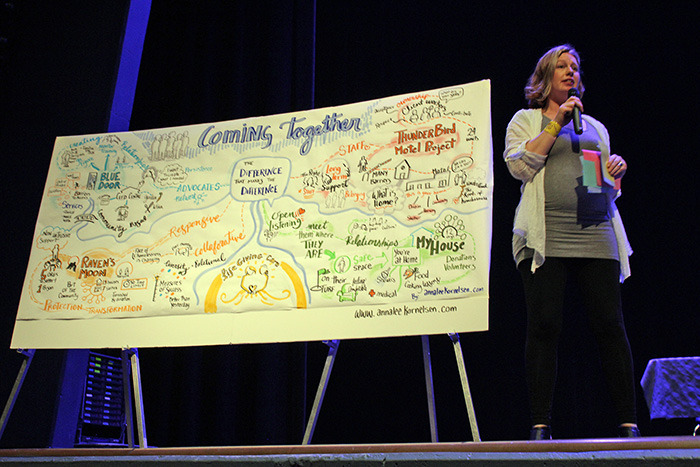 Coming Together, a day-long symposium on the issues of homelessness, mental health and addiction, took place in Mission on Wednesday. After a full morning of seminars and presentations, representatives from four Fraser Valley service groups – Scott Guitard of the Mission Youth (MY) House, Paul Keller from Hope’s Thunderbird Motel Project, Teesha Sharma from Blue Door in Maple Ridge, and Sharon Forbes of Raven’s Moon in Abbotsford – answered queries from more than 85 service workers and politicians who came from across the Lower Mainland. He said by bringing these people together, ideas could be shared on new models of partnerships and new ways of working together to discuss homelessness and addiction issues. He said some municipalities are “ahead of the game” in some areas, while work needs to be done in others. 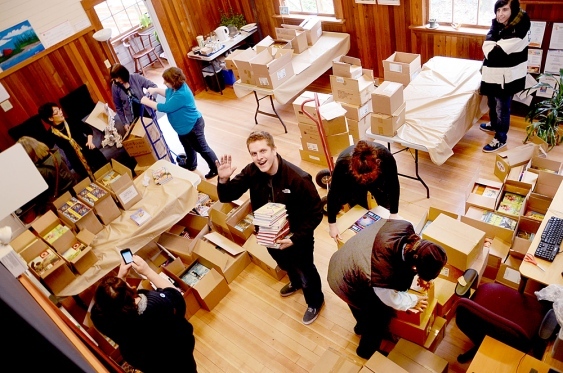 — Image Credit: Michael Hall/THE NEWS Volunteers sort through boxes at the CEED Centre on Wednesday as the Maple Ridge-Pitt Meadows-Katzie Community Literacy Committee received close to 8,000 free children’s books to distribute within the community. Volunteers sort through boxes at the CEED Centre on Wednesday as the Maple Ridge-Pitt Meadows-Katzie Community Literacy Committee received close to 8,000 free children’s books to distribute within the community. The new books are donated by publishers for children of lower income families who often do not have their own at home, as part of the annual First Book Canada Vancouver distribution. 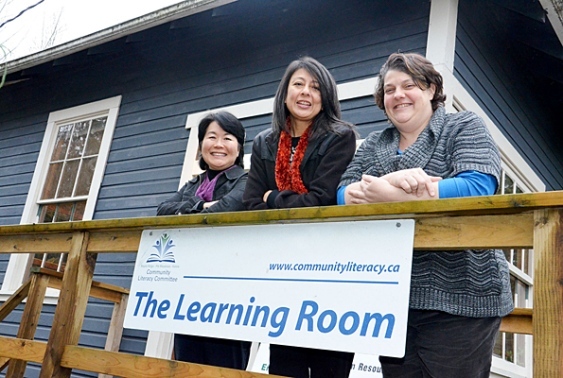 This is the fourth year the local literacy committee is coordinating the book distribution. Recipients will include the Ministry of Social Development and Social Innovation, Fraser Health, Family Education and Support Centre, Community Services, Friends in Need Food Bank, Ridge Meadows Association of Community Living, PLEA and Nurse Family Partnership Program. 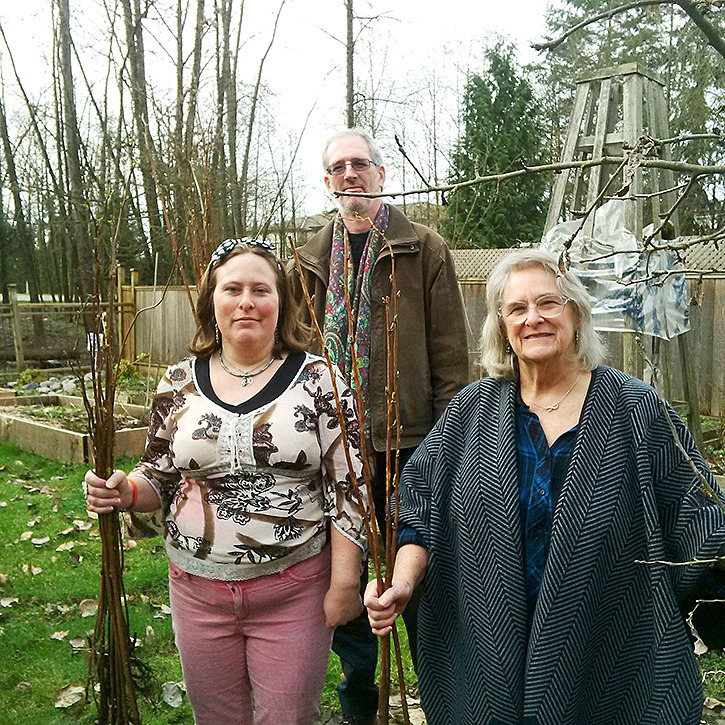 Gardeners Nick Osmond, Michael Sawyer, and Elaine Cormier held raspberry canes donated by Vash Ramsoondar for the Seedy Sunday seed exchange happening this weekend at the CEED Centre Organic Community Garden. The Community Education on Environmental and Development (CEED) Centre Society is holding the free event to give an opportunity for agricultural enthusiasts to exchange seeds and learn more about seed saving. Seed saving is taking the seeds from flowers, vegetables, fruits, berries, grain, or herbs and saving them for future use. Christian Cowley, executive director of the CEED Centre Society, said this event is part of a worldwide movement encouraging seed saving. In addition to exchanging seeds, there will be a presentation on the introduction of seed saving. Cowley said it’s not as easy as it sounds. Cowley said one of the CEED Centre’s goals is to improve the local food system, and he wants to create a large community garden. “There are no large community gardens in Maple Ridge,” Cowley said. He defined a large community garden as one that can accommodate 20 or more people. In order to create this garden, Cowley said he has asked Maple Ridge City council for land to build a complex on, and he’s currently waiting for a reply. In addition to the garden, Cowley wants to build a farm school to be run by one of the post secondary institutions. ​The event runs from 1 p.m. to 3 p.m Sunday, Feb. 28, at the CEED Centre, located at 11739 223 St. Everyone is welcome to attend. Cindy Bouleau has a tree farm on Thornhill. This year, she sent $820 from Christmas tree sales to Blue Door Youth Outreach, a new group formed under the CEED Centre banner. “I was overwhelmed,” said Sharma, a Blue Door founder. Homeless once, she knows what it’s like to feel hopeless, with nowhere to sleep. Blue Door also hopes to provide troubled youngsters a shelter to replace the one in Maple Ridge that the former federal government stopped funding last year. Sharma’s hoping to get it right for local youth. Getting it right in 2016 also means having more respect for local wildlife. Jurcich dialed 1-800-465-4336, the government hotline for environment. A receptionist promised to relay details to a conservation officer. “But, after two weeks, nobody had phoned me back,” Jurcich said. He took me to the spot. The carcasses were gone. Was this an illegal harvest of body parts, or a hunter dumping offal? That assures the ministry’s follow up. Marian Schwaiger, of Maple Ridge, was walking the dike recently when she noticed an oil slick on the North Alouette River, along Neaves Road. 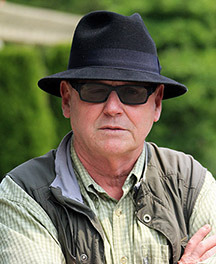 Schwaiger called the Pitt Meadows fire department. It sent an officer to look. Ross Davies of KEEPS thinks it’s been too cold for an algae bloom. At least the fire department responded, and quickly. However, it had to assume the role of investigator for the Department of Fisheries and Oceans since its Habitat Protection Branch was replaced with an 800-number. DFO’s trained pollution control staff have been sacrificed along with the will to protect our streams. Pitt Meadows is planning to hire its own environmental protection officer. “That’s what I want to see in 2016,” Coun. Mike Stark said. Scott Magri, of the Katzie Slough Restoration Project, wants one, too. He fished for trout in the slough as a teenager. An abused drainage ditch now, it’s a source of grief for Magri. He’d like council to restore water flow so other kids can catch in it fish again. “Restoring the slough seems a perfect project for Pitt Meadows,” says the volunteer who counts spawners with Doug Stanger of ARMS each fall. Both also pick up trash others throw away. We’ll all get it right this time if our government shows respect for local streams again. DFO monitored them, and counted spawners back to 1949. But, it’s abandoned the practice. And last year, Stephen Harper eliminated Section 35 of the Fisheries Act, which protected habitat, while leaving 100 species of wildlife on a waiting list under the Species at Risk Act. Jack Emberly is a retired teacher, local author and environmentalist. 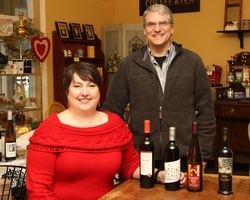 CEED Centre president Wendy Rairdan and executive director Christian Cowley checked out wines for the upcoming Cheers to the Planet fundraising event set for April 27.